I returned to The Daneside Theatre this evening to see Congleton Amateur Youth Theatre’s production of Oliver. This is my third review of Oliver this year and my second in a week. I really enjoy the show it’s really nice to see how each society puts their stamp on this classic by Lionel Bart. The director for this production was Louise Colohan. Louise is no stranger to direction, having directed CAYT’s production of Elf which won the NODA award last year for best male youth comedy performance. Louise staged this version as a traditional tale. The set, costumes, lighting and props were all sympathetic to the tradition and helped the audience be transported to the era, from the opening curtain. I really liked Louise’s vision and the overall staging. The set was fantastic. It enabled the actors to have many entrances and exits which were used very well throughout. I do question which door Oliver entered through at the end of the show as it was referred to in the previous scene as Fagin’s. There were a few other directorial decisions that I wondered about. Such as the changing of tempos of music and playing around with the script. Whilst I understand the reasons for doing so, I’m not sure if they all worked. However, I must admit, some of the cuts helped with the overall pace which was very good. I commend Louise and her team for the great characterisation and storytelling – something that goes a-miss when putting on a production of Oliver! Choreography was by Louise Carter and Sam Sherliker. The choreography was in-keeping with the era and the overall style. I felt that the cast could’ve been challenged a little more with more intricate choreography but with the limited spacing I’m not sure if this could’ve worked as well. All actors were very well rehearsed in choreography. Musical Direction was conducted by Mike Richardson. Lots of the tempos of the songs were much faster than normal. Although this helped with pace, for me, it didn’t work. There were quite a few ‘bum’ notes played, and for me, the vocals of the cast were the weakest link. Having a small three-piece band helped give this production a more intimate feel but using tracks and a keyboard/synthesiser meant that it wasn’t sympathetic to the traditional style. I also didn’t like the changes to the music that took us away from the score, such as the ending of ‘Food Glorious Food’. The set for this production was brilliant. Whilst being visually stunning, it gave height, various locations, countless entrances and exits and was used very well throughout. I particularly loved the curtain and fireplace etc for Fagin’s Den. The costumes, props, make-up and wigs were also very good. I appreciate that it must be hard having to age children to play adults but CAYT and their teams did this very well. I thought that the costumes were great and the make-up and facial hair etc for Fagin was great too. Scene changes were generally good for the small wing space that the Daneside has. The lights were very good. I love the downlights that were used throughout, particularly the blue downlights that bounced off the steps from the upper level. This helped give the piece and eerie feel whilst keeping it well lit for the audience to see the action. I quite liked that some of the scenes at the beginning of the show were in near darkness. Whilst I’m not sure if this was intentional or not, it seemed to create a good atmosphere and helped the audience to be transported back to the time period. Sound was generally good. I felt that the band were a little too noisy but I’m being very picky. Overall, I could hear all actors clearly and the balance between band, cast and audience was good. Oliver was played by Charlie House. Charlie was suitably sweet and very much looked the part. Charlie was a good storyteller and was very confident on stage. There were times when pitch became an issue, particularly during ‘Where is Love’ but the audience enjoyed his performance. Dodger was played by Oliver Rhodes. I can tell that Oliver is a very good actor and he did well in this role. However, I felt that it was under-played a little too much; a little too naturalistic. I suspect that Oliver would make a great television actor. Oliver certainly looked the part and had a great rapport with Nancy, which is sometimes missing from productions. Fagin was brilliantly played by William Vickers. I have had the pleasure of seeing William perform before and he is a fantastic character actor. I love watching William perform. He commands the stage, takes his time and performs with great interpretation. William was great casting for this role and all of his physical attributes that he brought to this role did not go un-noticed by me. Nancy was greatly played by Cerys Griffiths. At times, Nancy can be over-played and over-sung. Not in this production. Cerys brought a fantastic energy to the stage and a fresh version of this iconic role. Whilst Cerys was a little pitchy and unsupported in her song ‘As Long As He Needs Me’, I didn’t care as she acted her way through this! Far too many actresses think the emphasis should be on the vocals and not on the storytelling and I thank the director and Cerys for the brilliant storytelling tonight. Bill was played by Alex Wilson. Alex did well for a boy his age and held his own. He was suitably scary and brought a good physicality to the role. I felt that he had a good rapport with his fellow actors and he did well to try and convey his story. There were certain moments when I lost diction and articulation, but I suspect that this was down to the strong accent. Mr Bumble was played by Oscar Eckersley. Oscar did very well in this role – better than some adults that I have seen! Oscar had excellent diction, articulation and projection and was a great storyteller. I enjoyed his song ‘I shall Scream’ with Widow Corney. Widow Corney was played by Amy Fitzgerald. I really enjoyed Amy’s performance and felt that she found a lot of humour within the script. Amy had a great rapport with Oscar and they really worked well together on-stage. Well done! Mr Sowerberry and Mrs Sowerberry were played by Alex Wilson and Hannah Bleackley. Both actors found the humour within the text and were suitably good storytellers. I liked the way that Hannah used her voice to convey her character. There are far too many other roles for me to mention in this review. Overall, this production was visually very good. I felt that the overall acting and storytelling was brilliant, the choreography was very good but that the vocals needed a lot more work. The set, costumes, and technical elements such as make-up and lights etc made this show visually very good. Well done to this great cast of young actors. I genuinely thought that your storytelling was great, and the audience certainly enjoyed it very much. 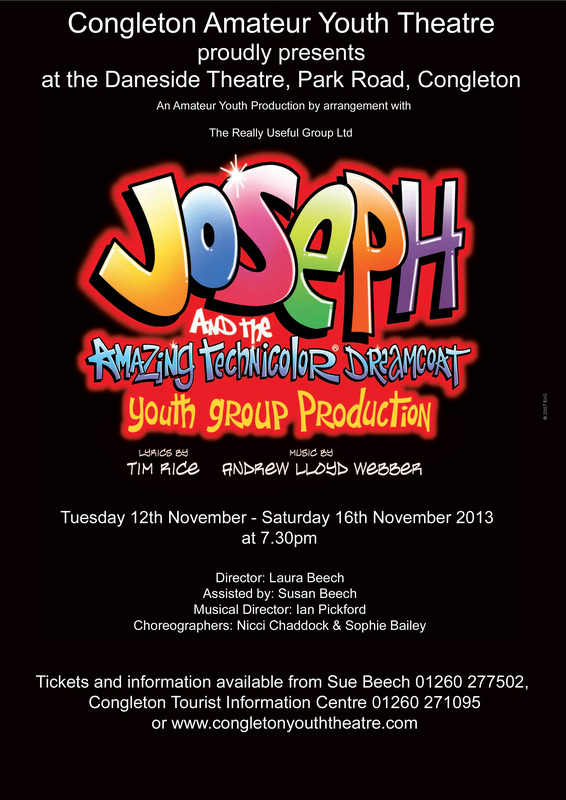 Well done to CAYT and their inclusive cast and team for another great production. I look forward to coming back again to see your 2019 productions such as The Fantastic Mr Fox! Creator Lionel Bart’s musical Oliver! must surely have some of the best known show numbers in the world of Theatre. Congleton Amateur Youth Theatre delivered them with great enthusiasm. Really timeless feel good songs, Food Glorious Food; Consider Yourself; Oom-pah-pah; As Long As He Needs Me; Reviewing the Situation. The two young male leads Oliver, Charlie House; and the Artful Dodger, Oliver Rhodes; bring a wonderful mix of innocence and street smarts to their roles, very enjoyable portrayals. All of the principals showed good characterisation, belying their youth, bringing Bart’s Dickensian world to life. Oscar Eckersley, as Mr Bumble; had a real humorous empathy with Amy Fitzgerald, opposite him as Widow Corney. The haughty Mrs Sowerberry, Hannah Bleackley was very watchable, as was the excellent WilliamVickers’ Fagin, performing the part with a subtle underlying menace. Cerys Griffiths as the warm hearted Nancy, the downbeaten girlfriend trapped under the thumb of the evil Bill Sykes, Alex Wilson, becomes caught in the middle of the action, as she desperately tries to help Oliver with tragic results. The production team have worked extremely hard with their cast to make the show a visual and aural treat for their audiences. The sound was crystal clear, for both dialogue and songs, a few very minor issues with microphones but otherwise spot on. Lighting for the brilliant multi-level stage set was really good, vivid and colourful. Directed by Louise Colohan, she played to the strengths of her young cast. Together with Musical Director, Mike Richardson, whose small ensemble excelled. A strong back stage team assisted in bringing Oliver to the audience. The hard work and enjoyment from everyone on the stage was a joy to see. Congleton Amateur Youth Theatre proudly produced their version of this classic play and I was fortunate enough to grab a ticket to see it. Wind in the Willows tells the story of Mole, Rat, Toad and Badger and their quest to defeat the horrible Weasels. The script has undertones of adventure, morality and friendship with hidden messages for the audience in every scene. Wind in the Willows was directed by Darren Brown and assisted by Louise Carter. I think that this play is a difficult one to direct as there are various locations and it is challenging to try and show this onstage. Darren and Louise did well to combat this and I was suitably impressed with the creative ideas that they had; using the whole stage to its full effect. I loved the idea for the Riverbank and the boat (and barge) were creative and visually delightful. Whilst the set was limited, it was greatly used, and the audience were able to tell where the action was taking place. If I’m being picky, I also felt that some of the scenes lacked pace and energy, particularly some of the group scenes. Scene changes were good, and the use of music was appreciated throughout. The set was limited but effective. I loved the use of the ‘hills’ with their fake grass and reeds. The bespoke boat, barge, trailer and train were all well-made and used greatly to aid the plot. I loved the use of the sheet for the river, even down to the waves/ripples. The lighting was great and the colours used-very effective. The lighting greatly reflected the set and each scene was very well lit and appropriate for that scene. The lighting at The Daneside Theatre is usually fantastic and I was not disappointed again. Props, Costumes and Wigs were brilliant. Each character was individually distinguishable due to their costume. I enjoyed the touches to costumes to make it clear to the audience which character was which animal. I liked the use of added facial hair and make-up to provide this continuity further. The props were used well throughout. I liked the large collection of props for the banquet. The sound was relatively, generally okay – due to the fact that the actors didn’t have microphones. This; coupled with a noisy audience, full of children and teenagers, it was difficult to hear all of the words from the stage all of the time. There were various stage mics that worked and picked up some of the sound but the mics at the front were not working. Mole was played very well by Oliver Rhodes. I enjoyed his characterisation and energy he brought to the role. I liked his glasses and how Oliver used them to develop his character. Oliver had good diction and articulation also. Rat was played by Alex Wilson. Alex is a good storyteller and has a good stage presence. He also had a good rapport with his fellow actors. If I’m being picky, I would’ve preferred a little more energy and non-naturalistic characterisation, but Alex was well liked by the audience. Oscar Eckersley played the role of Badger. I really enjoyed Oscars version of Badger. He did very well vocally, and I loved his characterisation and commitment to his role. Well Done Oscar! The star of the show for me was William Vickers who played the role of Toad. William is an excellent actor with a great energy and commitment to role. I loved his characterisation and confidence on stage. He told the story well and found the humour within the text, particularly, when playing the ‘Washerwoman’. Well done William! It would be very unfair to me to name any others, specifically as there are far too many to mention. I found that whilst some young actors had a good stage presence and gave everything to convey their character (both vocally and physically) others lacked character development and passion. Generally, all told the story and the audience enjoyed this play… NODA’s tag line is to inspire amateur theatre – you certainly did this. Well done! Based on the 2003 motion picture of the same name, starring Will Ferrell, but by no means identical to it, Elf the musical has a score by Matthew Sklar and Chad Beguelin and is presented this week by Congleton Youth Theatre at the Daneside Theatre in Congleton. It is the story of Buddy the Elf, an orphan who turns out not to be an elf at all, as given away by his enormous size and his inability to make toys. He has somehow crawled into Santa’s sack as a baby and been at the North Pole ever since. Forced to face up to the fact that he is actually human, Buddy sets off for New York to trace his real family and finishes up by reminding the New Yorkers of the true meaning of Christmas – a totally feel-good musical for all the family presented by a talented 9 -18 year old cast. Director, Louise Colohan, is to be congratulated on her excellent management of a very large cast of boys and girls, who presented the different scenes from the North Pole to Macy’s store to Mr. Hobbs’ office most professionally. Although the show does not contain any very memorable songs, the enthusiastic chorus and the gifted lead actors had the audience humming along with the tunes. The orchestral accompaniment, the projections and the scene-shifting were all of high quality and it was obvious that much hard work had been done not only by those on stage but by an army of backstage workers. Special mention must go to William Vickers as Santa, Lizzie Lomas as Emily and Rosie Beaumont as Michael for their good characterization and tuneful singing but Ben Birkett as Buddy, the elf of the title, stole the show: he had excellent presence on stage, a good voice, exuberant energy and a natural ability to play the clown. This young man of only 16 years of age is definitely someone to watch out for in the future. Get a ticket if you can for this fast-selling show. What a pity it is not on for longer! The production team did a fantastic job with brilliant direction, fabulous music and harmonies from the cast and lovely chorography which the cast delivered really well. The cast were absolutely wonderful, all smiling and truly looking like they were having a ball. Ben Birkett played Buddy fantastically well with great vocals and totally believable acting as the Elf who is actually human. My favourite scene in the whole show was at the end of Act 1 in Walter Hobbs office where dressed in a suit Ben still showed every characteristic of Buddy the Elf. The timing in this scene was perfectly executed. Brilliant job Ben. William Vickers was brilliant as Santa from his jolly voice and perfect diction to his wonderful stage presence, Marcus Wesley was great as Walter Hobbs, changing character slowly through the show with super vocals and command of the scenes he was in. His scene with Ben as mentioned above in his office was superb as he never broke character or laughed once during that scene which must have been really hard to control. Jovie was beautifully played by Mia Eckersley with lovely vocals and totally believable characterisation. Her annoyance initially followed by a softening feeling towards Buddy was lovely to watch. Lizzie Lomas was great as Emily Hobbs with gorgeous vocals and believable acting and her scenes with Rosie Beaumont as Michael Hobbs were full of warmth as Rosie shone in her role. Their songs together sounded stunning with beautiful harmonies. Oscar Eckersley was great as The Manager of Macy’s and supported the other members of the cast really well and Amy Fitzgerald was super and very funny as Deb the secretary to Walter Hobbs. The supporting members and chorus all characterised their parts well and their joy was infectious to the audience who thoroughly enjoyed the show. Well done to everyone involved including the production team and backstage staff as the whole show was beautifully put together. Roald Dahl was a unique voice in the world of children’s literature. His dark imaginings have certainly secured him his place in the top ranks of children’s authors. The Witches, one of his darkest novels centres around a meeting of witches at a seaside resort on the south coast of England. Boy, the hero of the story, is orphaned at an early age, and taken into the care of his Norwegian grandmother. Following a bout of ill health, she and Boy take a recuperative vacation to a hotel in Bournemouth. Grandma is wise to the existence of witches throughout the world, and knows the signs to identify them. However, even she is ill prepared for the dark adventures that await her and Boy. Congleton Amateur Youth Theatre have assembled a fine ensemble cast to bring David Wood’s theatre adaptation of the novel to life, and it is no mean feat that they have achieved. This is a technically demanding show which calls for multiple sound and visual effects, as well as numerous scene changes. They are to be commended for having produced such an enjoyable evening’s entertainment. Directors Dee Melia and Jennifer Matthews have clearly worked very closely with the cast with great dedication, and they should be very proud of the talent they have developed. The twenty-plus strong cast are clearly enjoying the experience, and their enthusiasm keeps the plot motoring along as it heads to its dark climax. This is not a grim play though, as the more sombre themes are softened with much humour, and there are many genuinely funny moments throughout the evening. Hannah Bleackley plays Boy with great skill. Her transformation from boy to mouse is effectively realised, and Miss Bleackley has clearly worked hard on the way she moves around the stage. Her performance is matched by that of Bronwyn Jennings playing a sympathetic and endearing Grandma. In contrast, Clara Jackson’s Grand High Witch oozes malevolence, and Miss Jackson maintains a Germanic accent very effectively throughout her performance. Bruno Jenkins, an unlikely accomplice to Boy, is played with great humour by William Vickers. Initially unlikeable, he elicits great sympathy when he becomes the first victim of the witches. There are an astonishing number of witches on the stage at times, and the cast are clearly relishing the opportunities this provides for both nastiness and great humour. The complexities of the sets do lead to some rather slow changes, but the demands required by the script for so many changes make this a particular challenge. The sets themselves are very effective and the occasional use of projection is an imaginative touch. The use of an additional, self-contained kitchen set provides the opportunity for a particularly frantic ‘cooking’ episode in the second act. Rosy Astbury and her wardrobe team have had an immense task in assembling so many costumes and wigs, but must have had great fun in the process. The Witches delivers a suitably spooky and entertaining evening of theatre which showcases the pool of local talent in the Congleton Amateur Youth Theatre. The Witches by Roald Dahl and adapted for stage play by David Wood is a sheer masterpiece in writing, brought to life before our very eyes. Characters we remember from our childhood leap off the pages onto the stage to bring a story of gruesome witches wishing to eradicate the world of children. A lesson of love, loss and the ultimate sacrifice of the hero “Boy”. A lesson that sometimes one must make a sacrifice for the greater good. Congleton Amateur Youth Theatre took on a big challenge in choosing this piece but they didn’t fail to impress. A difficult production to stage from the demands of the script to have many scene changes and visual illusions. Overall, this was delivered quite satisfactorily. On entering the venue the audience were greeted with a projection which was an animation taking over the whole stage. This was creative and you could grasp from the content what was in store for us. The running mouse really tickled me and hats off to the designer Simon Matthews. Other projections were used to create the sea crossing, which was also effective, I felt a tad sea sick watching the waves move up and down. Once the gauze was lifted we had the most amazing three tier set behind. Really impressive work and very creative. A kitchen to the right full to the brim with utensils, attention to detail was so impressive. This piece has a secret compartment behind where our hero Boy could operate the mouse puppet. Grandmother’s chair to the left side offered a sign of comfort, it was very homely indeed. The levels of this set were used to great effect and the team seemed to have a very clear vision throughout, the cast were confident in climbing and using it to its fullest potential. The stage crew must be commended as they at times where requested to change set as “hotel staff “. The character playing the hotel manager ordered them about and it really worked well. The illusions were projected on to a smoke ‘screen’, this worked well visually but the smoke was a tad over powering when it hit the audience. The direction throughout was of fine detail, each player understanding their roles completely. I can imagine a lot of work was done to achieve this level of characterisation. My eye didn’t draw to one person that wasn’t fully involved in this piece. Lovely use of puppetry which was well delivered by the players. Visually the costumes and wigs looked remarkable and it finished the whole look of the production. I got the sense that the boys disguised as ladies were quite comfortable and rather enjoying their new look. We saw some wonderful characters and the meet and greet section of the scene the characters really went for it, a few very comical moments. Hannah Bleackley, what an actress. She portrayed the part of the hero “Boy” with curiosity, fear, empathy and confidence. Miss Bleackley processes the ability to draw you in and feel her every emotion. Her facial expressions were always appropriate, her use of her body to create the mouse-like traits was commendable. She worked very well with the puppet and her fellow cast. Right to the very last scene, this young lady was living every emotion, never dropping out of character. Bronwyn Jennings – a warm portrayal of Grandma, lovely work with “Boy”, they had a lovely connection. She carried her role well. On a few occasions we lost some of her lines but I feel it was due to the movement she was doing (hugging) as opposed to her not projecting. Mason Bell, played a good role as the Events manager, ordering the stage crew around came very easy to him and he got everything in order. He had some nice comedy with the doorman. William Vickers, gave a great rendition Bruno Jenkins, at first, we cannot warm to this spoilt boy but as he became a victim of the witches we do feel sympathy for him, especially in the scene where he learns he is a mouse. He interacted well with Miss Bleackley, the pair worked well in their scenes. Clara Jackson had a fine accent for her role as the High Witch, she looked every inch the glamour puss with dark undertones, her eyes spoke a million words, dark and drawing visually. We could have had a bit more volume from this player. She instigated her scenes and was always in control. Oscar Eckersley played numerous roles and very well may I add. His Mr. Jenkins was urgent and unsettled, his relationship with Bruno was lacklustre and unaffectionate. You could understand why Bruno was the way he was. Lucy Fitzgerald on the hand played the doting and very glamorous mother of Bruno, Mrs Jenkins. Her son can do no wrong. I would have liked to see a bigger reaction to the news that their son was a mouse. Lewis Bell and Marcus Wesley as the chefs made us laugh out loud with their antics, self-made gravy and the result ending with a mouse down the pants. A classic slapstick type moment. Great chefs but I don’t think I would risk eating anything they cooked. What really stood out from this production was the array of parts each member played, the development of characters, the concentration and the enjoyment that was evident on the stage. Worthy of mentions are the doorman, display witch, headwaiter, chambermaid, nurse and sailor. Sound overall was good but there were some missed lines due to projection from the players. The music used throughout gave a magical feel and added to the ambience, also to mention the sound effects they were very accurate and on cue. Lighting was executed very well. There are a lot of timing factors involved in this play and require everything to work simultaneously, the lighting cues were spot on. I would suggest that the pace could have been improved upon at times and the transitions from one scene to another were a tad on the slow side. Overall, this was a good production which really challenged the young players. Plays are so very important and give a young player a chance to develop other areas of performance. Well done to the whole team. Congleton Amateur Youth Theatre gave a professional performance with a humorous take on a Shakespearean classic…with a rock ‘n’roll twist. All Shook Up is set in middle America in the 1950s and is a modern day telling of Shakespeare’s Twelfth Night. The young cast, led by Richard Vickers, who played out-of-towner Chad and Rosie Pearce as female mechanic Natalie, took the Daneside Theatre crowd through a number of Elvis Presley’s most well known songs, kicking the evening off with Jailhouse Rock. As well as a number of Elvis’s timeless classics, the story was filled with punchy one-liners and of course, a number of jokes related to those infamous blue suede shoes. With vocals well beyond their years the Audience’s reception to the final night performance was phenomenal. They all took to their feel to jive to one final Elvis medley. Both leading parts put in excellent performances, as did Ben Birkett, who played Natalie’s geeky and often overlooked best friend Dennis. It wouldn’t be surprising at all if the principal cast found themselves treading the boards of the West End in years to come. A number of powerful performances and a particularly poignant heartbreaker left some people in the audience holding back the tears. All Shook Up was a fantastic performance and anyone who fancies a professional standard production in town should definitely check out Congleton Amateur Youth Theatre’s future shows. For one week only at the Daneside Theatre…….Elvis Lives!!! All Shook Up is a new musical comedy which steals a tiny bit of plot from Shakespeare’s Twelfth Night, while featuring songs made famous by Elvis Presley. The action takes place in a 24 hour period during the summer of 1950, somewhere in middle America, where one girl’s dream and a surprise visit from a mysterious leather-jacketed, guitar-playing stranger help a small run-down town discover the magic of romance and the power of rock & roll. Among the songs featured in the score are classics like “Heartbreak Hotel,” “Love Me Tender,” “Don’t Be Cruel,” “Can’t Help Falling in Love,” Jailhouse Rock” and of course the title tune. Meanwhile, it certainly has some Shakespearean elements, with a girl disguised as a boy, forbidden love across the divide and everyone falling in love with the wrong person. Rosie Pearce gives a convincing performance as Natalie, the tomboy hopelessly in love with bad boy Chad. Her secret longing for him is effectively communicated in her acting, movement, speech and singing. Another strong performance is that of Ben Birkett as geeky Dennis. He gives a great comedy performance, but is also capable of pathos and his singing is at times very moving. Lizzie Lomas has a lovely singing voice of great purity and clarity and her duet with Marcus Wesley (“It’s Now or Never”) is one of the highlights, their voices blending beautifully. This point in the action also contains a most ingenious staging effect, as the cast create a bus before our eyes. Hannah Bleakley as Miss Sandra, the prim museum director, gives a game performance. Tottering elegantly on high heels, she isn’t afraid to extract all the humour out of her ever-so-slightly ridiculous character. Richard Vickers gives a solid performance and looks great as the mysterious stranger Chad, but a bit more swagger and confidence would have added some welcome charisma to the character. There is excellent support from the rest of the company, who quickly change costume to play multiple parts: townsfolk by day and night, jailbirds, angels and devils. When everyone is singing the sound is truly impressive. Another of the highlights is the first half finale, “I Can’t Help Falling In Love With You”, sung beautifully by the six leads before being joined by the entire company: a moment to send shivers down the spine. Louise Colohan directs the cast with flair, achieving an impressive level of pace and energy. Musical director Sarah Francis gets the best out of the company, and five talented musicians play live for the show. Congleton Amateur Youth Theatre provided something for everyone in Wanted! Robin Hood, a classic adventure tale with humour and a modern twist. It ran from Thursday to Saturday at the Daneside Theatre, Park Road, Congleton. In this version of the story it was bookish yet feisty Marian, played by Lizzie Lomas, who seamlessly stood in for the role at the last minute, that saved the day and brought the body count up to respectable levels. At the end the stage was littered with the carcasses of the Sheriff of Nottingham’s men – all her handiwork. For fans of the traditional story there was also lots to cheer. Walter Fitzwarren, the Sheriff played by James Gittins, was dastardly as ever. Guy of Gisbourne, played by Oliver Rhodes, was just as sinister and Friar Tuck, played by Joe Buxton, was as joyfully gluttonous as always. Richard Vickers was well cast as Robin Hood, swashbuckling in the mold of the Kevin Costner and errol Flynn films but performed with a touch of playful mischief. special mention should be given to Ben Birkett, who played the snooty yet conniving Sir Eustace, protege of Fitzwarren, brilliantly. He spent the evening elongating his vowels and turning his nose up at the rest of the cast. He came “good” at the and – though not without braining Robin with a French baguette in in Scene 12 The Archery Contest first. Not sure, from the look on Robin’s face, it was part of the script. It certainly had the audience gasping. Ben played it for all it was worth. If unscripted it was well improvised and credit has to go to Robin who struggled on manfully albeit, no doubt, with minor concussion. Hannah Bleackley had the audience in fits playing Much the miller’s son and Rosie Beaumont did a great job bringing the play alive as Acorn, one of the Merry men and a sort of silent narrator. The whole cast provided a great night’s entertainment and was greatly aided by a fabulously designed set. Hopefully many of them will be back for their next production All Shook Up. The Little Mermaid is a stage musical based on the animated 1989 Disney film of the same name. Ariel is a rebellious young mermaid fascinated with life on land. On one of her visits to the surface, which are forbidden by her father, King Triton, she falls for a human Prince. Determined to be with her new love, Ariel makes a dangerous deal with the sea witch Ursula to become human for three days, however, plans go awry for the star-crossed lovers and the King must make the ultimate sacrifice for his daughter. From the very opening of this musical it was great to see the work which had gone into the scenery. The boat carrying the sailor and Prince Eric was impressive and in the underwater scene became a wreck adorned with skeletons and the most creative of coral adornments which was visually stunning, even close up. Throughout there were excellent touches such as umbrella jelly fish, a mixture of projection and live action, heelies to give freedom of movement and fantastic costumes, all of which added to an undersea world which was truly believable. This combined with use of the whole theatre not just the stage and creative ideas such as having the Princesses on land as caricatures of the Disney Princesses show that Director Louise Colohan has a lot to offer, well done. Sebastian (Richard Vickers) brought some great humour to the show along with Chef Louis (Rosie Pearce) and both performed well. Hayley Holford looked small as Flounder in comparison to Sebastian and Ariel but this really worked and she was a joy to watch with great delivery of her lines. Having to have six Mersisters can show weaknesses in depth of vocal quality for a society but this was not the case as they all had great voices, excellent harmony and slick heely work in their choreographed numbers. Alison Jones had obviously worked hard to deliver all the great dances. The music was of a very high standard with a live band keeping the songs moving, both Ian Pickford and his assistant Becky Morley should be congratulated. Ursula’s (Ella Beaumont) villainous and powerful character came through well and her dress looked incredible adding to her character as the integral lights gave an eerie feeling as she emerged from her cave. Ariel (Lizzie Lomas) looked and moved like a Disney Princess, her emotions came through well and had a lovely uncertain air with all things human which made us all giggle. Both Ursula and Ariel had quality voices and their numbers ‘Poor unfortunate Souls’ and ‘Part of Your World’ were excellent moments in the show. Another stand out performance was that of Ben Birkett as Scuttle and although a small role his acting and singing combined with comedy timing really entertained the audience. Along with the audience we all had an excellent afternoon, I was very impressed with the standard and professionalism of these young actors and singers and can’t wait for their next production. When Congleton Amateur Youth Theatre staged Disney’s’ The Little Mermaid Jr at Daneside theatre last week, judging by the audience reaction, the musical was anything but shallow. There were waves of laughter from the children who were obviously fans of the animated film they’ve no doubt watched on TV dozens of times. Adapted from the 2008 Broadway Production, the show featured hit songs Part of your World, She’s in Love and the Oscar-winning Under the Sea. It followed the famous Disney movie derived from the Hands Christian Andersen tale of the beautiful young mermaid Ariel who falls in love with the human Prince Eric. The role of Ariel was taken by Lizzie Lomas who gave an outstanding performance equally matched by her on-stage rival and all-time wicked sea witch Ursula, played by Ella Beaumont. The story begins when Ariel becomes fascinated with the human world and longs to live there but her farther Kin Triton is very angry when he hears she has been to the surface. In desperation Ariel turns to the sea witch, who gives Ariel legs in exchange for her voice, promising she will remain human as long as the prince kisses her by sunset on the third day. However, Ursula had treachery and deceit on her mind, which left some dangerous but comical adventures for Ariel and her friends, Flounder the fish, Sebastian the crab and Scuttle the seagull. All the supporting sea creatures, both frolicsome and dastardly were on board, and with their impressive costumes and comical impersonations they left the audience wanting more. Sebastian (Richard Vickers) and Scuttle (Ben Birkett) were hilarious, giving convincing performances as Ariel’s’ sidekicks. Overall the play delivered on all of its promises. It was enchanting, funny and an utter joy for all Little Mermaid fans. Asking an old cynic such as myself to review The Little Mermaid is a bit like inviting Mr Scrooge to Christmas dinner, or introducing your unmarried daughter to Bluebeard. As I was entirely unfamiliar with the show, I asked my colleague Cath about TLM and she treated me to a rendition of Under the Sea and offered me a small child to take with me. In the event I needn’t have worried, as a good time was had by all. The story is loosely based on a Hans Christian Anderson story, and features the time-honoured themes of forbidden love across the divide and good versus evil, as handsome, adventurous prince with legs falls for feisty girl with fins; while a wicked witch does her dastardly best to put a spanner in the works. Lizzie Lomas as Ariel excels, with beauty, character, stage presence and a singing voice of great purity and clarity. Other stand-out performances include Ella Beaumont, who plays wicked sea witch Ursula with more than a hint of Glenn Close at her nastiest. Her singing is fabulously evil. There is a confident performance by Richard Vickers as Sebastian the crab, and one of the highlights of the show is his leadership of the company in a rousing version of the Oscar-winning calypso number Under the Sea. Hayley Holford as Flounder acts well and has a particularly clear speaking voice. Joe Pearce and Hannah Bleakley as Flotsam and Jetsam are suitably evil servants to Ursula. Their sinuous movements are very effective. There is excellent support from all the other leads and from the whole company, who quickly change costume to play multiple parts: merfolk, princesses, sea gulls, sailors and chefs. As always in Congleton Amateur Youth Theatre, the youngsters get an amazing level of support from a huge number of people. Louise Colohan directs the cast with flair, achieving an impressive level of pace and energy. Musical director Ian Pickford gets the best out of the company, and three talented musicians play live for the show. The choreography (by Alison Jones) is varied and well executed. The costumes (made by a whole team of helpers) are stunning. The set and projection effects are imaginative and very effective, and the sound and lighting are just right and perfectly executed. So don’t be a misery. Get out of your arm-chair, leave your fireside and the telly and get along to the Daneside Theatre for this excellent show. A wonderful evening’s entertainment – Rats’ Tales, a series of seven plays wonderfully presented and thought provoking. The cast in all seven plays gave good strong performances albeit that the content in some was a little difficult for them to understand, but their naivety helped to bring it across to the audience. The set was handmade and positioned exactly right, almost giving a 3D effect. It’s always encouraging to see so much enthusiasm in youth groups. Outstanding performances were given by Pied Piper, Stranger, Horse, Father, (Marcus Wesley) and Woodcutter, Squire (Joe Pearce) both gave extremely good characterisations in their various roles and an individual very well done to you both. The costumes especially the rats were well thought out and looked very good. Overall very well presented – a lot for the cast undertake but done extremely well. I was really pleased to be invited to Congleton Youth Theatre’s production of Alice in Wonderland as I have never seen this version before and it proved to be a really enjoyable afternoon of entertainment . On the whole the show follows the traditional story, it has a lovely musical score and has a wide variety of character roles for the performers to really enjoy. Ella Beaumont was an excellent Alice , a very confident actress with a beautiful singing voice and she related so well to all the other characters – a super performance. Rosie and Joe Pearce made a very lively and entertaining Tweedledum and Tweedledee, with Lauren Frost as a enigmatic Cheshire Cat with a fabulous smile and James Gittins as the energetic, but always late White Rabbit. Louise Condliffe and Tommy Chatten were a suitably regal , but totally mad Queen and King of Hearts, Daisy Mitchell and Amy Fitzgerald were entertaining as the Duchess and the Cook creating mayhem in the kitchen scene. Richard Vickers (Mad Hatter ), Lizzie Lomas (March Hare ) and Mason Bell (Dormouse) opened act 2 with an enjoyable “Time for tea”, followed by the Queen’s croquet game where I really liked the “human” croquet balls – a very clever idea. Xander Jacques as the Caterpillar, and Marcus Wesley as the Mock Turtle performed their musical numbers well, Kate Holland working well as the Griffin. There were also a wide range of other roles in this production including playing cards, computers, footmen, butterflies, birds and other creatures, all of which were played with enthusiasm by the young performers. The set and props were kept simple but effective with a good use of projections and complementary lighting, the costumes were imaginative and colourful and the musical numbers were led by an excellent orchestra with choreography that was suitable for the performers. This production was well directed by Laura Beech the performers were confident and enthusiastic, and along with an appreciative audience I really enjoyed the show – thank you for inviting me. 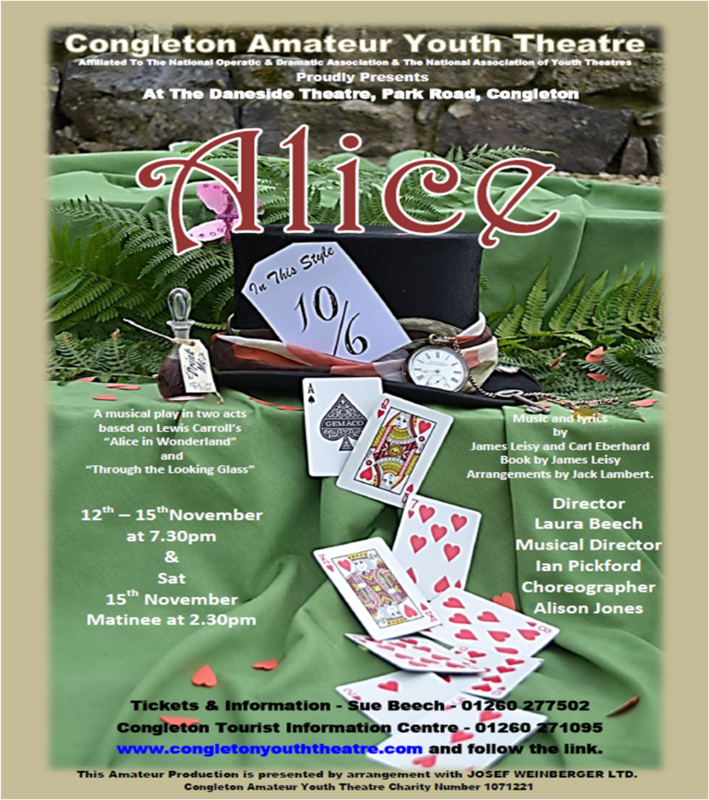 Congleton Amateur Youth Theatre presented an entertaining production of this school version of Alice, which combines Alice in Wonderland and Through the Looking Glass last week. The musical starts with Alice sleeping by the willows before the White Rabbit appears. She follows him and meets The Computers, who decide whether people are rejects or not. She follows the rabbit who has left his gloves behind, and eventually meets the Red Queen. On the way she runs through scenes from Wonderland (pool of tears, the caterpillar, Cheshire cat, the duchess, the pig and the pepper, the tea party and croquet) as well as meeting Tweedledum and Tweedledee from Looking Glass. The story is portrayed in word and song. Of particular note was the performance of Ella Beaumont as Alice, as she was on stage for the whole play and performed confidently throughout; she’s well known for her good singing voice, which shone on more than one occasion. Of the other characters, Rosie Pearce (Tweedledum, her real-life brother Joe being her twin on stage) stood out as having a real stage presence. The role was created to have some physicality, with the daft twins introducing slapstick to the musical, but she could shine in a more adult role, with her confident body language and charisma. Similarly good was Louise Condliffe (the Red Queen) whose appeal on stage was aided by her towering wig. Ella aside, two other singers impressed, Marcus Wesley as the Mock Turtle, who should (if he doesn’t already) look at folk-singing, as his voice would suit that genre, and Daisy Mitchell as the Duchess, who had a powerful, soulful singing voice. She was clearly reining in what is probably a powerful sound. But it was as much an ensemble piece as one for individual performances, and the cast as a whole worked together well to make this an enjoyable performance, right down to the dormouse (Mason Bell) head-butting the table to comic effect. The set builders also deserve praise. The set was cleanly designed and simple but worked effectively to convey the bizarre scenarios in which Alice finds herself. An enjoyable production; the three-year-old we took enjoyed it, too, so much that he wants to go to Congleton Amateur Youth Theatre’s next production. Successfully blending the dark, the funny and the colourful, Congleton Amateur Youth Theatre’s Grimm Tales provided an unmissable voyage into the world of fairy tales. The group’s performance of Carol Ann Duffy’s adaptation of the Brothers’ Grimm was billed as an atmospheric take on five classic tales, combining movement, mime and the spoken word, and it successfully delivered a treat for onlookers young and old as the cast explored the darkest depths of childhood fears. The tone was set right from the start as the lights went out, with solitary music box notes creating an immediate aura of uneasiness, which rippled through the audience as an ancient door creaked open. The eerie music continued to echo around Daneside Theatre as two children explored the beautifully-designed set, where they discovered a dusty book of fairy tales and embarked on a journey of their imagination through the tales of Hansel and Gretel, The Golden Goose, Ashputtel, Iron Hans and The Lady and the Lion. The scene would prove to be an effective transition between each of the five stories, with the two children remaining at the corner of the stage turning the pages as the rest of the cast acted out a physical manifestation of what they were imagining. The five tales showcased a skilfully interwoven mix of darkness, pitch black and slap stick comedy, and the expected happy endings. Highlights included a downright hilarious scene in The Golden Goose where seven unsuspecting people became mysteriously stuck to Dummling’s Goose and stumbled into, over and under each other as they were pulled around the stage, much to the audience’s amusement. Hansel and Gretel proved to be the darkest of the lot as a family was torn apart by desperate hunger and the children were left abandoned in a forbidding forest, skilfully created by the chorus. The performance was rounded off by The Lady and the Lion, which saw a princess finally reunited with her love after seven years of searching – a fitting finale. Under the direction of Jennifer Matthews and Dee Melia, the enthusiastic and talented youngsters all acted out their parts with gustoa and the excellent sound and lighting continued to provide a magical atmosphere throughout, delivering a true fairytale experience for the audience. You can’t beat a good Andrew Lloyd Webber Musical and Congleton Amateur Youth Theatre did a fine job of one of his most enjoyed works and packing in the audiences at the same time. In the lead role, young Jack Posnett as Jospeh acted and sang his way into the heart of the character with a fine portrayal. He kept the show together with lots of energy and enthusiasm bringing all the necessary skills to the stage and displaying an obvious love for performing. The Narrator, Helena Lomas, told the story with composure and a great singing voice and lovey diction and intonation. The Brothers all stepped up to the mark with heaps of energy executing the musical numbers well and with plenty of confidence. I especially liked Joe Buxton’s portrayal of Potiphar, whom the audience clearly loved and also that of the Pharaoh played by Adam Davies. The cameo roles were all well cast with some obvious talent shining through and it was encouraging to see a few new faces amongst the cast who show promise to be CAYT stars of the future. The basic set worked well and was mixed with a fab lighting plot which created an effect which really enhanced the production. The costumes all worked well and had “feel good” running right through the production. I especially loved the Technicolor Coat, which is a dream for any leading man to wear! The production team should be congratulated for pulling together a lovely production and giving everyone a chance to really shine at a sell out production. Something that is seldom seen these days. I really enjoyed the ‘ Megamix’ which was probably as long as the production itself however gave everyone the opportunity to sing aloud and join in the infectious fun that everyone was having. Congratulations Congleton Amateur Youth Theatre and thanks for letting me experience some of your wonderful productions over the last few years. I wish you all the best for the future. Congleton (Award Winning) Youth Theatre hopped aboard and set sail for yet another jaw dropping production, which was attacked with enthusiasm and a professional polish that was way beyond their years. It’s hard to believe that such young performers can tackle such a wordy production with wonderful diction, projection and a clear understanding of delivery. The production, expertly directed by Dee Melia and Jennifer Matthews was full of energy throughout and with lovely colourful and authentic costumes and props, it made for quite a spectacle, not forgetting the parrot puppet which almost stole the show! The whole cast tackled the script and injected their own characters and traits which developed and contrasted nicely as the show went on. It was lovely to see such young performers taking on smaller cameo roles and must be congratulated for their confidence and I look forward to seeing how much they’ve come on next year. Performances of note came from Matthew Gittings as the betrayed Jim Hawkins and the infamous Long John Silver was played by Richard Vickers. Both characters gave outstanding performances are were such wonderful role models for the rest of the cast and the young members of the audience. Rosie Pearce as Meg Trueblood portrayed a strong and confident presence and Lauren Frost as Lady Trelawney was also amongst the bright lights. The set was really fantastic and complemented even further by a great lighting plot and projections. It was clear that this project was the result of many months of happy hard work – congratulations to all involved. 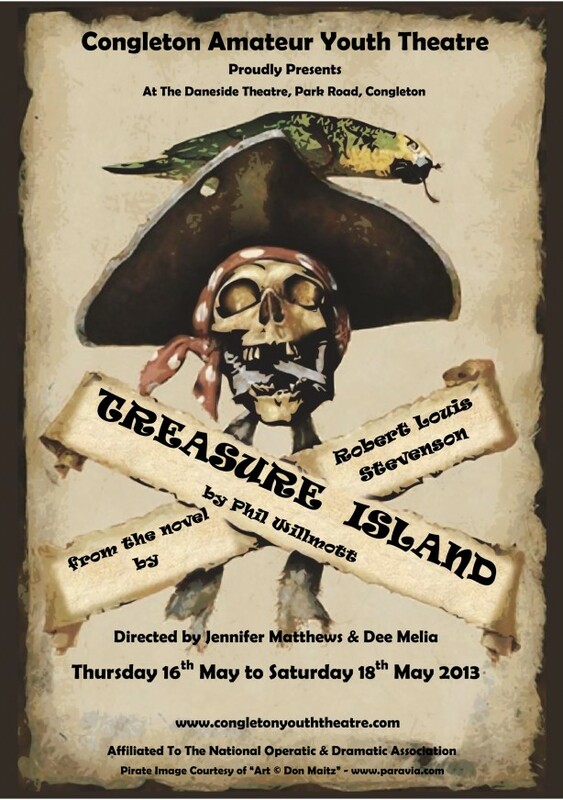 It was an energetic and lively night for the Daneside sea dogs when Congleton Amateur Youth Theatre showcased the classic Treasure Island on Thursday. The Daneside Theatre let the young actors and actresses hop aboard to give Congletonians a night to remember with sword fights, drunken renditions fo the well-known pirate song Drunk Sailor and stunning costumes. The use of language was spectacular for such a young cast with excellent, believable pirate accents. Directed by Jennifer Matthews and Dee Melia, the first scene set the tone and told the story preparing the audience for the second part, which was full of excitement and action. Young Jim Hawkins, played by Matthew Gittins, sets his signs on the high seas looking for buried treasure with what he thinks is a hard working and loyal crew, only to find out he was sailing with a bunch of scallywag pirates out to kill him and the captain to take the treasure for themselves. Tricked by Long John Silver, played by Richard Vickers, Jim must find a way to outwit the scoundrel. The opportunity came about when the pirates got up to their usual tricks of enjoying a bottle of rum. After a close battle of the swords the good guys won the day and took home the gold, ending Treasure Island on a jolly note. 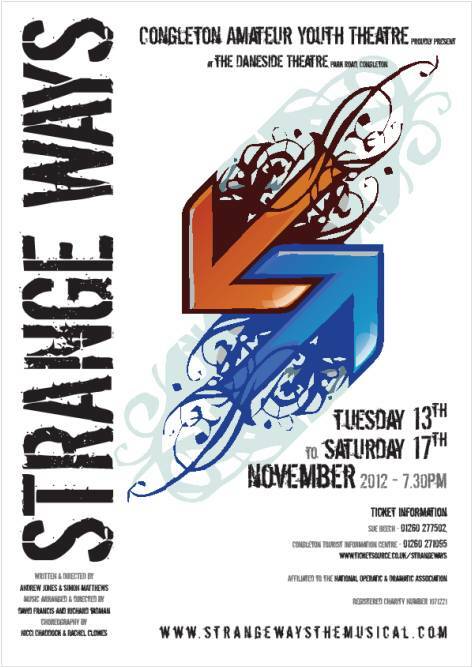 Strange Ways; a brand new musical with a wonderfully imaginative concept by Simon Matthews and Andrew Jones. CAYT were always the first and best choice for this production which was packed with humour, energy, tons of twists and turns along with a catchy soundtrack which was completely original by Richard Tadman and David Frances. Both the script and the music and lyrics were expertly put together to create something quite unique and indeed special – something I am sure the production team and the company are very proud of. And rightly so. Leading man Keiron Ansell as Norman Strange literally threw himself into the soul of his character portraying his upside down world perfectly. This must have been a complex character to grasp, especially for someone so young, but Keiron did a sterling job. Chelsea Oliver as Sarah was quite delightful, she embraced her character well giving a confident portrayal with lovely vocals. Andrew Cruze narrated us through the story with tongue in cheek delivery which had me chuckling away. Whilst Jack Posnett had me ‘belly laughing’ with his portrayal of King Arthur. “Any other Way” was a real show-stealer. Fantastic job Jack! The supporting cast and company all did an amazing job and all contributed to making the show move at a good pace with impressively slick, choreographed movement and scene changes which all added to a very smooth run. Every musical number was executed with explosions of energy where each member would sing their hearts out. Strange Ways is a brilliantly witty and clever script which I would encourage any youth or adult group to get hold of to perform. 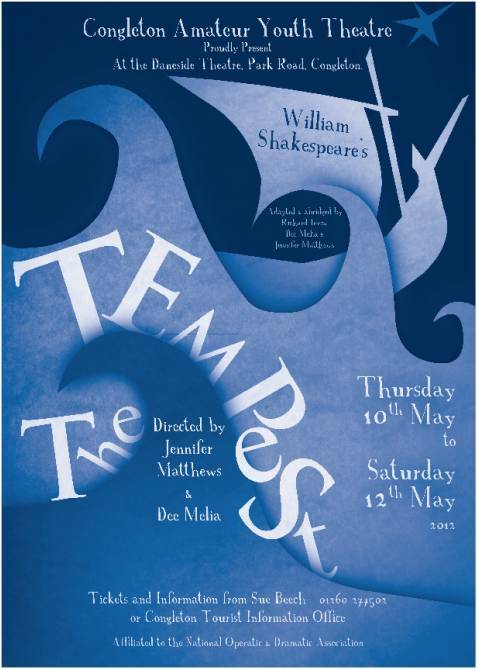 If someone ever said to me that a cast of youth performers, some as young as 11, could pull off a decent performance of Shakespeare’s ‘The Tempest’, I’d have thought it to be a very ambitious and brave move for all concerned. This production highlighted the sheer determination and indeed talent CAYT has to offer as well as putting me and my sceptical thoughts well and truly into place. With a really workable set that looked brilliant and enhanced by terrific lighting and projections I knew from the outset that we were in for a treat and I wasn’t disappointed. The cast of 20 took one of Shakespeare’s great plays and told the story with confidence and clarity and maturity far beyond their years. Each performer understood both their character and their role within the play, all giving confident portrayals and showing such technique in their acting abilities. I was mesmerised. The principals in particular delivered some outstanding work, delivering long speeches with such emotion and depth. I particularly enjoyed Harry Jones’ performance as Prospero, a complex character yet Harry gave such clarity. Charles Vickers as mischievous Ariel, maintained this weird and wonderful character throughout and Joseph Pearce as Caliban was outstanding. I must congratulate directors Dee Melia and Jennifer Matthews for their dedication to this youth group and all the work that they must have put into this production and for taking this play from page to stage with such a creative style. It was so apparent that the group were completely engaged and embraced the challenge and had heaps of fun doing so. In return, I loved your Production and left the theatre educated and inspired. NORMAN Strange leads a pretty dull life. He can’t pluck up the courage to tell Sarah he loves her – but one day he runs into the road to pick up her dropped purse – and the end of his life is the start of the story. Norman is on trial – should he go to heaven or to hell? The sins of his ancestors hold the answer.Simon Matthews and Andrew Jones wrote (and directed) Strange Ways especially for Congleton Amateur Youth Theatre. Its music ranges from The Carpenters to Queen, from David Bowie to Abba. It bubbles with humour and dreadful puns, and is enhanced by Simon’s skilful use of graphics and projection. There were some nice touches in the direction too – I enjoyed the human furniture, and the non-existent lift was most convincing. There are some excellent voices; Jemma Grayburn, as Lucy Fur, belted out her numbers with gusto, while narrator Robert Lightfoot coped admirably with difficult Bowie songs. Norman, played by Kieran Wesley, and Sarah, Sasha Pattison, delighted the audience with their romantic Carpenters duet.It’s a pity some of the radio mics kept cutting out, and the voices were sometimes not loud enough, but the theatre was pleasingly full, and the audience was ready to enjoy the music, clapping along happily. It’s a show for CAYT to be proud of.